In order to attract and retain top talent, organizations need to offer benefits programs that suit individual needs and life stages, as well as providing transparency and portability. While employee awareness of benefits is lacking, compensation and benefits is one of the most important components of reaching business results In Turkey. Despite the high importance placed on comp and ben, organizations are still struggling to identify creative ways to attract and retain talent. Moving to a flexible benefits program is not easy. It involves redesigning the benefits package, complete with professional employee communications. To justify such a large-scale HR project, the program must deliver on containing costs and increasing employee satisfaction. Let’s look at an example of a company that provided more choice while staying cost-neutral. The figures are in Turkish lira and our employee is married. 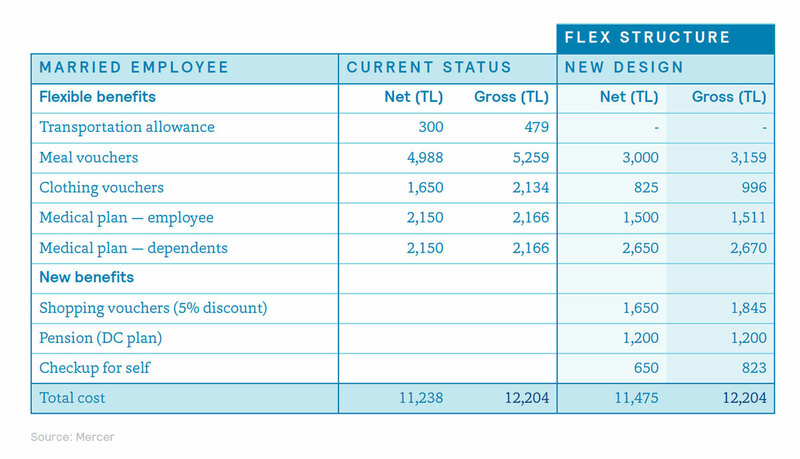 The value of the benefits package is 11,417 lira, with a gross cost to the company of 12,204 lira (after the national social security premium the employer must pay). By using a flexible structure, the employer stays cost-neutral while the employee can personalize or even increase his level of benefits. Flexible Benefits: The Key to Total Rewards that Attract Talent? By using a flexible structure, the employer stays cost-neutral while the employee can personalize or even increase his level of benefits. Organizations must look for effective ways to manage rewards while meeting the diverse needs of employees. The six ways of offering flexible benefits outlined in this article is a good place to start when trying to determine creative strategies to attract and retain talent.